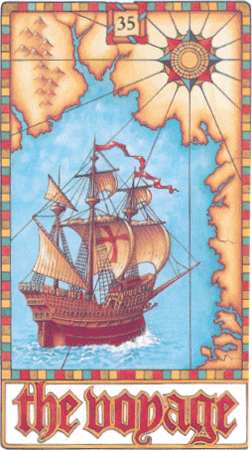 The Voyage Card reminds us that the Airmiles we can clock up do not relate to the psychological distances we travel. A voyage changes you. On arrival you are not the person who sets out. Holidays are one thing. This card could also be telling you that you are now ready to make a voyage of the mind or spirit. There are times in our lives when we need roots. There are others when we need horizons. This may be prompted by restlessness or dissatisfaction with your present life. Drifting is the negative. The Voyage is the positive. A voyager needs to shed surplus baggage. If we travel psychologically light, we will be free of sentiments, illusions, hang-ups and trivial worries.